On the corner of the High Street and Maidstone Road, almost opposite the Post Office, is a vivid reminder of days gone by when the people of Marden would have to leap on a horse, instead of taking the bus, train or car, to travel any distance. Some people were not up to leaping and this is where the mounting block was useful; it provided a step up into the saddle for the elderly and inactive. 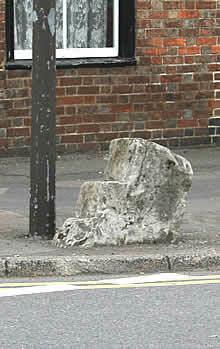 Known locally as the Mounting Stone, the origins of Marden’s mounting block have been lost in time, but it is believed to be of Kentish ragstone, probably eighteenth century from Boughton Monchelsea quarries. Many such blocks were once provided in towns and villages throughout the country, some at public expense, others donated by the lord of the manor. As well as the one in the middle of the village there are other mounting blocks in the parish. Designs varied: some were made of bricks, sometimes incorporated into a wall; others were composed of smaller blocks of stones; some, like Marden’s shown here, were hewn out of a solid block. Country-wide few now survive, having been cleared away as redundant and in the way. Happily Marden’s has survived, perhaps the fact that it is a massive solid block, and therefore difficult to demolish, saved it in the past. Now it is a treasured part of village history.